This Attic Windows quilt pattern is a bit different than a traditional Attic Windows quilt, where windows of the same size are sewn side-by-side. To make this quilt, Attic Windows blocks are sewn in three different configurations that can be mixed-and-match in the quilt. Select one or more pictorial fabrics to fill your windows, and fussy cut the required patches if you like. 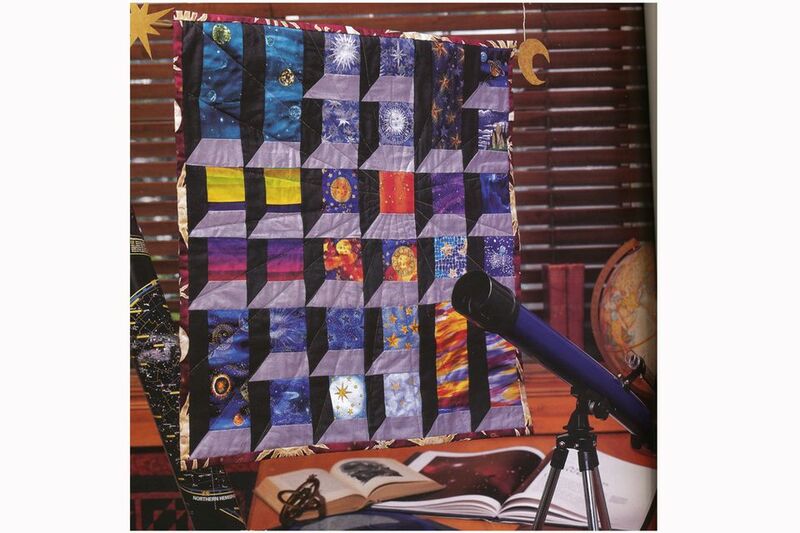 The quilt in the photo uses a print of the night sky to fill its windows. Window sills are sewn from two fabrics, one darker than the other to give the appearance of depth when their angled corners are joined. Attic Windows Finished Size: 24-1/2" x 24-1/2"
Assemble more windows to create a larger quilt. Be sure to consider the 1/4" seam allowance on all sides of a patch if you decide to fussy cut the windows. Make a window template if it helps you target a specific area of the fabric. Dark strips, cut five: 2" x 42"
Light strips, cut four: 2" x 42"
You'll use the setting in technique to sew the squares and rectangles to the windowsills. Use your rotary cutting equipment to square up one end of a dark sill strip. Square up one end of each remaining dark strip. Beginning at a squared up end, cut bars from the strips: six that are 8-7/8" long and twenty-four that are 4-7/8" long. Stack the bars in groups, right side up. Use your rotary equipment to cut a 45-degree angle at the left squared-up end of each dark bar by aligning the ruler's 45-degree line along the long edge of the strip, with the angle of the ruler exactly at the strip's end. The cut will look very much like the cut you make when you cut a right triangle. Be sure to cut the angle as shown in the illustration. Square up your light strips on one end and cut thirty 4-7/8" long bars. Cut a 45-degree angle at one end of each light bar, making the cut a mirror image of the dark sill as shown in the illustration above. Turn the sills over and mark each 1/4" inward from the angled edge and from the shortest edge to find the intersection of the seam line. Use a pencil or temporary marker. It's easy to mark the spot with a rotary ruler. Just place the ruler inward exactly 1/4" on each edge and mark near the end. The spot you're looking for is where the two lines intersect. If necessary, use a straight pin to find seam intersections when you're sewing. Match the angled edge of a bottom sill with the angled edge of a short side sill, right sides together. Sew along the angled edge, beginning at the matched outer tips and ending the seam at the marked intersection. Backstitch a few stitches and remove from the machine. Press the seam open. Measure 1/4" inward on two sides of a small window square to find the seam intersection. Be sure to mark the corner that will fit into the angled edge of the sills. Place the square right along the partially sewn bottom sill, right sides together and aligning straight edges. The mark on the square should match the mark on the sill--the place where you stopped sewing. Start sewing from the matched straight edges, moving toward the angle of the sills. End the seam at the mark. Leave the unit in the machine, needle down. Pivot the unit and align the next side of the square with the other sill. Match the seam intersection again and begin sewing. Sew all the way to the end of the matched patches. Press seam allowances towards sills. Repeat to sew all squares and rectangles to their sill counterparts. Arrange the multi-unit blocks into three rows as shown above. Sew the rows together, matching seam intersections carefully. Press seam allowances in adjoining rows in opposite directions. Sew the rows together, matching seams. Press. Mark for quilting if necessary. Sandwich the top with batting and backing baste. Quilt the quilt. Trim excess batting and backing, carefully squaring up corners if necessary. Bind the quilt and add a hanging sleeve if desired.